I’ve shared in the past about how exciting credit card points and miles can be. This being said, sometimes it’s nice to have straight cash back, especially on your everyday purchases. Free airline and hotel travel may not be on everyone’s mind. For those individuals that are looking for the best cash back credit cards, it’s hard to beat the American Express Blue Cash credit cards. comes in two flavors: the Everyday card, and the Preferred Card. Both cards offer excellent rewards for making your most normal purchases at: groceries, gas and department stores. Everyone needs to buy groceries, get gas for their vehicle(s), shop at department stores. No other credit cards can top the cash back percentages that these two AMEX cards offer. Let me break down the difference between the two credit cards. · Earn Cash Back: 6% US supermarkets up to $6,000 per year in purchases, 3% US gas stations & select US dept stores, 1% other purchases. Terms and limitations apply. · Cash back is received in the form of Reward Dollars that can be redeemed as a statement credit. · Simple and Straightforward: With the Blue Cash Preferred Card, you can start earning cash back. No rotating reward categories. No enrollment required. · 0% intro APR on purchases and balance transfers for 15 months. After that, your APR will be a variable rate, currently 12.99%-21.99%, with the flexibility to pay over time. · Terms and Restrictions Apply. · Earn Cash Back: 3% at US supermarkets, up to $6,000 per year in purchases, 2% at US gas stations & select US dept stores, 1% on other purchases. Terms and limitations apply. · Simple and Straightforward: With the Blue Cash Everyday Card, you can start earning cash back. No rotating reward categories. No enrollment required. No annual fee. · 0% intro APR on purchases and balance transfers for 15 months. After that, your APR will be a variable rate, currently 12.99%-21.99%, based on credit worthiness and other factors. Even when you take into account the Preferred card’s $75 annual fee, you still come out on top with the amount of cash back you can earn. Which credit card do I recommend? 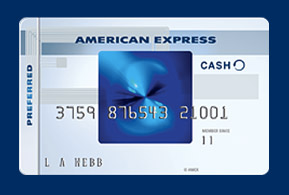 If you are more into points and miles, I recommend starting with the Blue Cash Everyday® Card from American Express. I currently have this card and always use it at the supermarket. If cash back is more of your thing, I would not hesitate to recommend the Blue Cash Preferred® Card from American Express. When you buy something and it gets broken or stolen within 90 days, even if you are at fault for accidentally damaging the product, AMEX has got you covered. If you buy something within 90 days and you want to return it, American Express may refund the full purchase price up to $300 per item, even if the merchant won’t take it back. The maximum for this benefit is $1,000 annually. I always recommend making big and important purchases with a credit card. Let’s say you buy a new laptop and the manufacturer’s warranty runs out, AMEX will cover your purchase by extending the warranty up to one additional year. When you pay for your car rental with your AMEX Blue card, you can be covered if the car is damaged or stolen. Put your mind at ease and say “no” to unnecessary rental car insurance. So no matter which American Express Blue Cash® credit card you choose, you can easily and quickly earn cash back. There are no gimmicks or reward limits. Just straight up cash back.